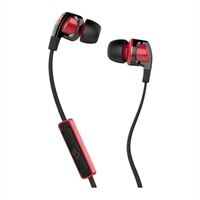 Skullcandy Smokin Buds 2 Earphones with mic in-ear 3.5 mm jack - black, hot redWhether you're walking down the street or gaming on the couch, Bluetooth functionality makes it possible to take your audio anywhere you go. Wireless freedom also means no tangling cords and makes for easy storage when you're done listening. Enjoy the comfort and sound of your earbuds for a full 6 hours, without having to worry about recharging. Carefree listening is yours wherever you choose to take your soundtrack. Whether you're walking down the street or gaming on the couch, Bluetooth functionality makes it possible to take your audio anywhere you go. Wireless freedom also means no tangling cords and makes for easy storage when you're done listening. Unlike other bulky and stiff products on the market, this low-profile collar is made of moldable plastic that gently hugs your neck, and can be removed entirely if you prefer. Use the notches in the collar or the provided "S" clip to adjust for the perfect fit or keep cables secure in place. The Smokin' Buds 2 feature an angled and oval-shaped nozzle that aligns better with the natural shape of the ear, improving comfort and noise isolation. Whether you're walking down the street or gaming on the couch, Bluetooth functionality makes it possible to take your audio anywhere you go. Wireless freedom also means no tangling cords and makes for easy storage when you're done listening. Enjoy the comfort and sound of your earbuds for a full 6 hours, without having to worry about recharging. Carefree listening is yours wherever you choose to take your soundtrack.